I have to be honest. Monkeys scare me a little. No traumatic childhood ape encounters come to mind, but I have never been keen on our evolutionary cousins. Even those Monsheshe dolls which were hugely popular in the early 1980's had the opposite effect on me. Very creepy. 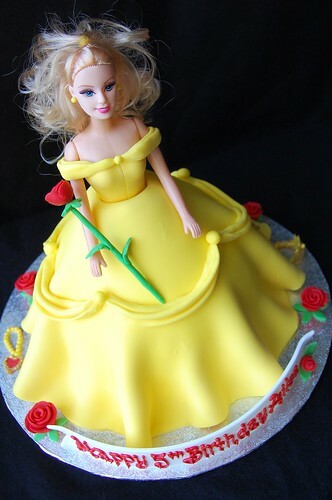 But everything in cake form seems cuter, doesn't it? 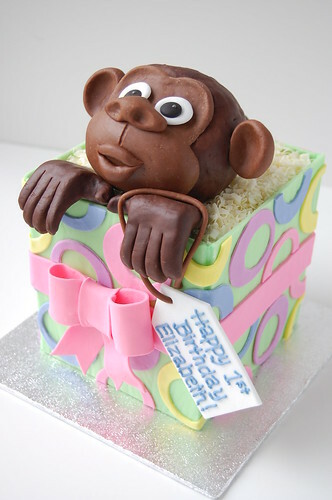 Elizabeth, whose term of endearment is "Monkey", was turning one, and to celebrate, a chocolate cake with dark chocolate mousse in the form of a 5" cube gift box was created. 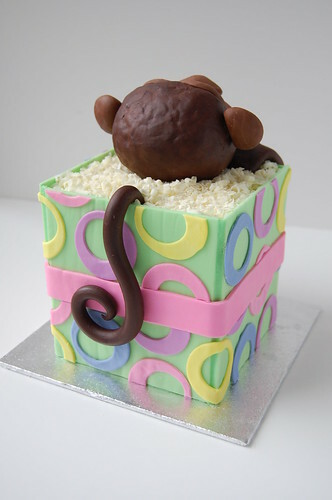 The cheeky monkey hiding in the box was constructed from Rice Krispie treat and chocolate modelling paste. White chocolate curls were the finishing touch. The gumpaste panels turned out quite well this time, nice and flush (I'll never be a carpenter). The hands and tail were my favourite details. If anyone happened to check, each hand was marked with a single palmar crease in homage to the simians. Happy Birthday Elizabeth! With all the wind and the rain in Vancouver lately, I feel a bit like a duck. 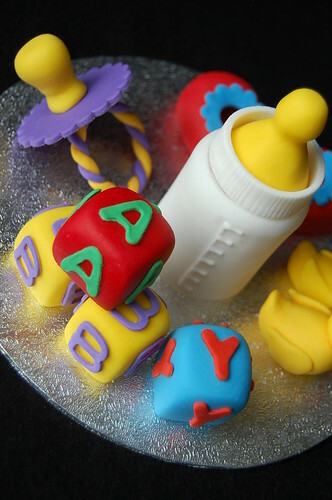 These decorations for a baby shower cake certainly brought some colour into my kitchen this week! Because the mom-to-be does not know whether it's a girl or a boy, a bright cheerful crayon colour palette was chosen. 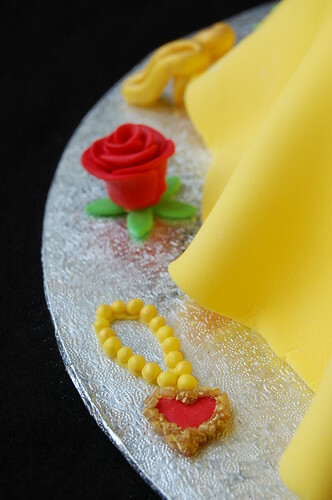 In fact, rubber ducks were not in my initial design plan but having some leftover yellow fondant from the Princess' gown, they were a natural addition to the gender-neutral baby paraphernalia. The bottle and pacifier were also very cute. The actual cake went to a shower full of dental care providers so I hope that their sweet teeths were satisfied! Congratulations! 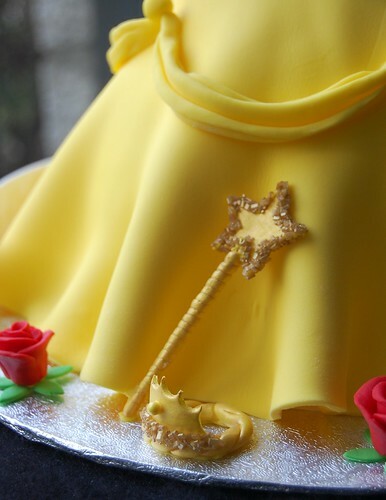 Once upon a time, in a distant land, there lived a beautiful Princess who had a very big oven in a very small castle. She had been warned by the previous owner of the big oven, a wicked witch, to bake only gingerbread men at 375F for 15 minutes, otherwise a terrible curse would befall anyone who dared to bake differently. Being very obedient and frightened of the curse, the Princess mixed the dough, rolled the dough, and baked the dough into dozens and dozens of gingerbread men every day. She became extremely efficient in her small kitchen and locally famous for her delicious gingerbread men but longed to try other recipes, oven temperatures, and baking times. There was no joy in making gingerbread men and the Princess grew forlorn and disheartened. One day, a frequent customer, Goldilocks, came by for a snack but complained, "Your gingerbread men are too big, Princess. You should make them half the size. That is what the bakers in Wonderland are doing.". Being eager to please, the Princess decided to make her gingerbread men smaller, convinced that she would not be cursed since technically, she was still baking gingerbread men at 375F for 15 minutes. Into the big oven, trays of small gingerbread men went and as the Princess cleaned her dishes and waited for the kitchen timer to ring, she began to notice a terrible smell and gasped at the thick black smoke rising from the charred small gingerbread men. The fire alarm began to blare and out from the small castle, the Princess ran, weeping softly as she thought, "The curse has befallen me!". Although the small castle and the big oven were destroyed by the fire, the Princess, having an excellent home insurance policy, received enough funds to purchase another small castle with a small oven in a much nicer neighbourhood. There, she slowly realized that indeed, the fire had not been the terrible curse which she had feared. On the contrary, her obedience to the strict rules of the big oven gave her what she ultimately wanted, the freedom and happiness to bake whatever she wished, at whatever temperature, for however long in her small but shiny new oven. 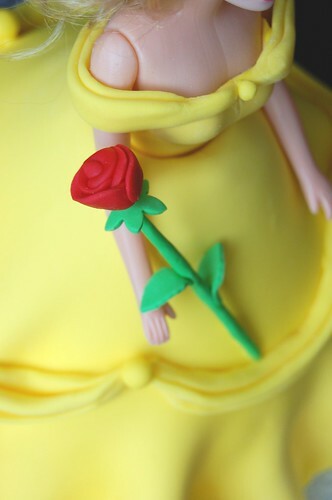 And so, the Princess lived happily ever after baking pies, croissants, macarons and every sweet treat imaginable. The End.